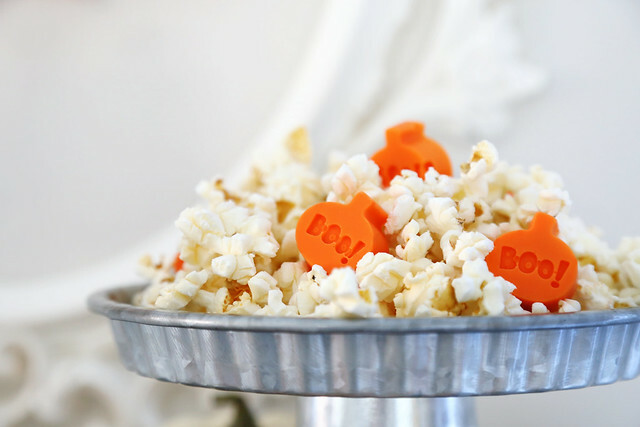 I have a quick and cute halloween party to share with you today: no tricks, just treats! I made 3 of everything so that each one of my kids could have a special little package on halloween day. My 2 oldest kids have retainers this year and they are already lamenting all the gummy candies that they will not be able to eat. ha! I love all of the critters dressed up in their Booyah costumes! Especially the bat sheep - cracks me right up! 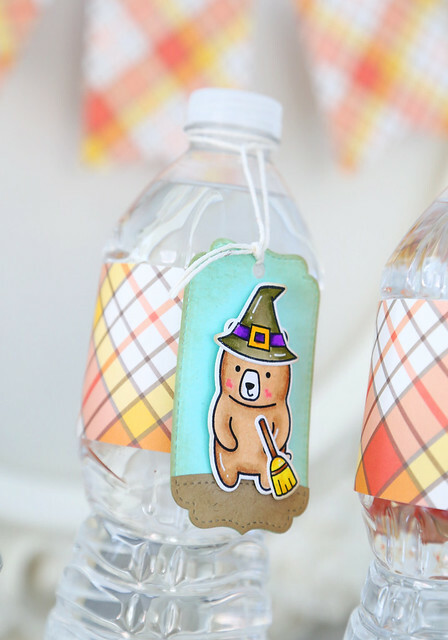 To dress up the water-bottles, I dangled tags (the Small Stitched Envelope label) dressed up with a casual knot. 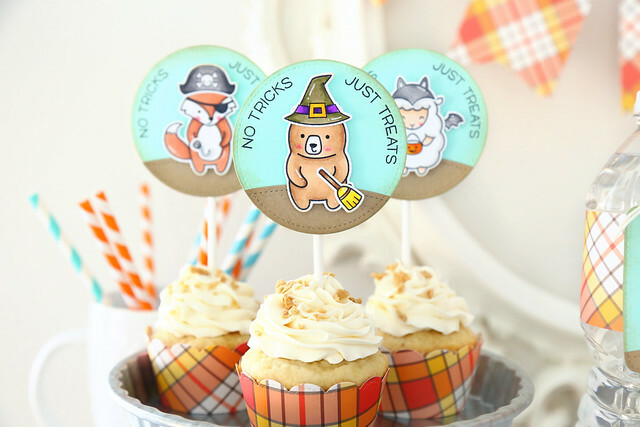 The cupcake toppers are my fave. I stamped the greeting, from Happy Howloween, to frame the images. 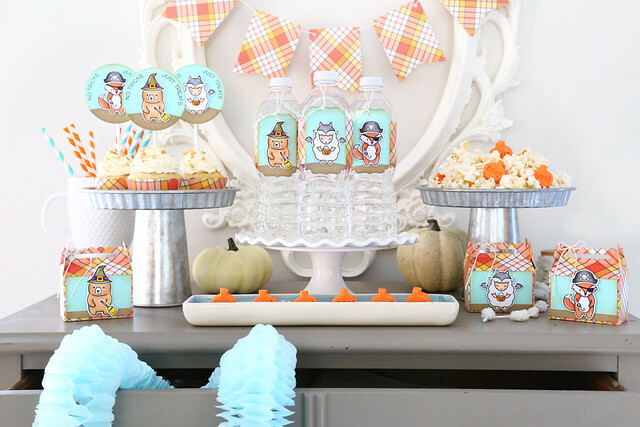 The Candy Corn patterned paper from Perfectly Plaid Fall ties everything together. 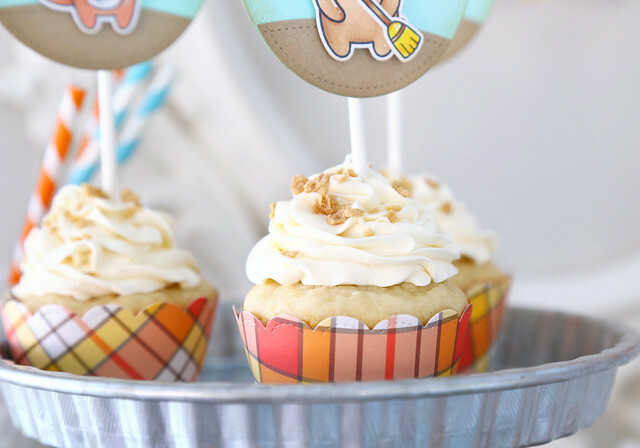 I just want to point out that the little sprinkles on top of the cupcakes are maple flakes. MAPLE FLAKES. I found a little jar on severe liquidation at William Sonoma (because I can't afford WS treats otherwise, I mean maple flakes at 3$ are fine, but at 25$? nope) and I have been putting them on everything. On toast, on oatmeal, in coffee. So good. Everyone loves maple, right? Not just me because of the Canada connection? Moving right along, these gable treat boxes are so perfect. I dressed up the same critters and slapped them onto the fronts. I hope you like my all-cute-no-spook halloween party! I set up for this photoshoot, and cleaned everything up before the kids came home from school. I can't wait for them to see it all put back together on Monday! For our last day of this month's Lawn Fawn inspiration week, I thought I would try something a little different. 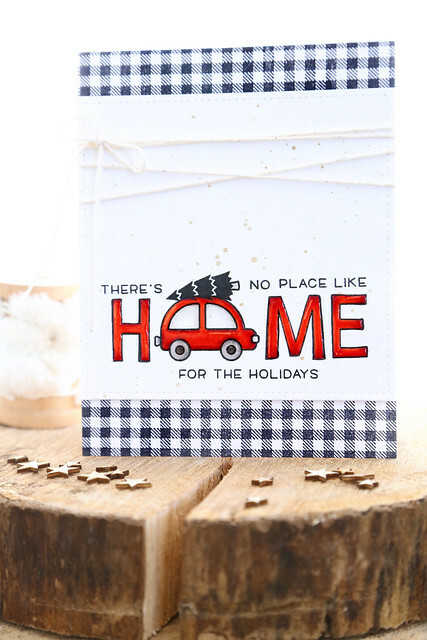 I stamped out the car, added the tree on top and stamped the lettering all around. The rest of it - "there's no place like....for the holidays" - came from Snow Cool. I did have to get a little creative to stamp out the word "no," since those penguins are only about the sNOw, but it all worked out. The gingham panels on the top and bottom were stamped using Gingham Backdrops - still a favorite! A simple card like this one needs a little special something. I added glossy accents to all of the letters and the car. It gives the card a much-needed pop! 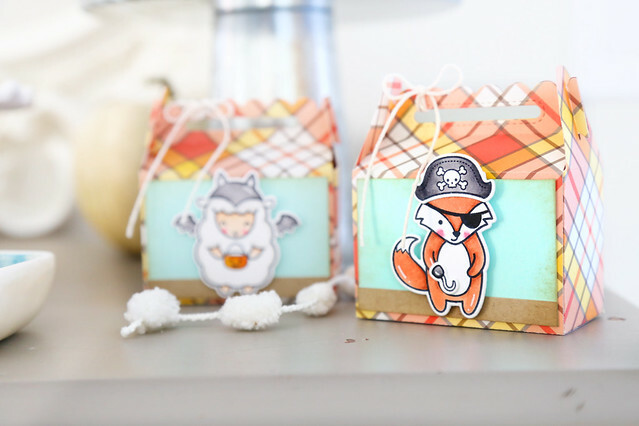 Hi there, and welcome back to another day of Lawn Fawn's October inspiration week! 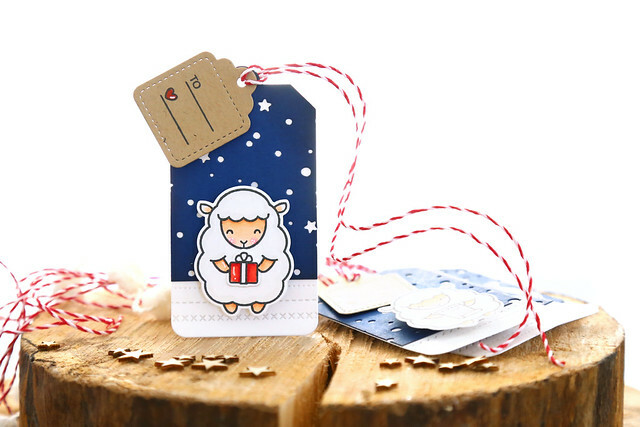 I used the same sheep as I did for yesterday's tags (because I told you I love him.) I also used the same stitched borders, only more of them on the card. To help the white sheep pop against the white die-cut circle, I rubbed some soft brown ink into the center of the circle die-cut, which was enough to set the sheep apart. Did you notice the figgy pudding balloon? From Party Animal. I added the icing top myself, with a copic-friendly pen. The berry and leaves are from Joy to the Woods. Also, the little Santa hat he's wearing and gingebread cookie he's holding are from Holiday Party Animal. 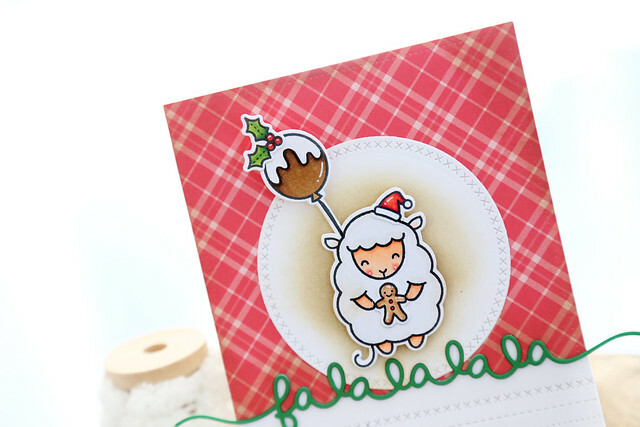 I nestled the Fa la la la la border right into patterned paper and die-cut circle, by cutting it into those layers so that everything would layer flat except for the sheep and balloon. 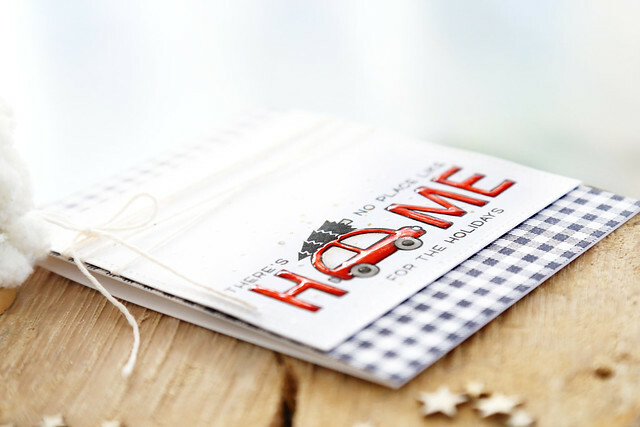 It's Lawn Fawn inspiration week, and today is our showcase of Tiny Tags and Tiny Tag Sayings. Any excuse I have to use this sheep again! I just love the Baaah Humbug lamb so much still. I double tagged it, layering the tiny tags onto the bigger Tag, You're It shape. I wanted the sheep to pop, so I put him against a starry night background (using the snowy backdrop die.) 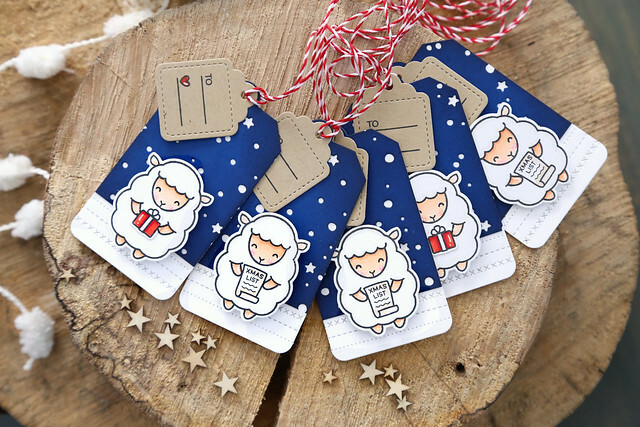 I cut the same tag shape out of navy cardstock, and then ran it through with the snowy backdrop die so that it had the same shape. I chopped it off to reveal the Stitched Border details on the base tag. I thought they worked so well with the sheep image! I hope you like my tags! Kelly Marie liked them so much she recreated one on video to show you - click! Just scroll down to the end of the LF blog post to see it. 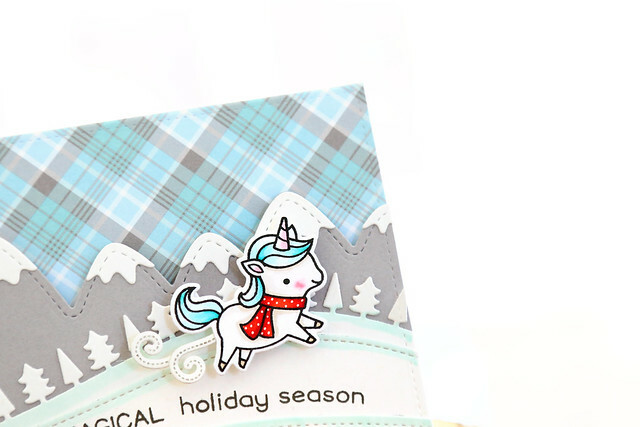 I nestled my little unicorn into a winter scene of Stitched Mountain borders. The sentiment is from Merry Messages, and I curved it a bit to follow the curve of the snowbanks. 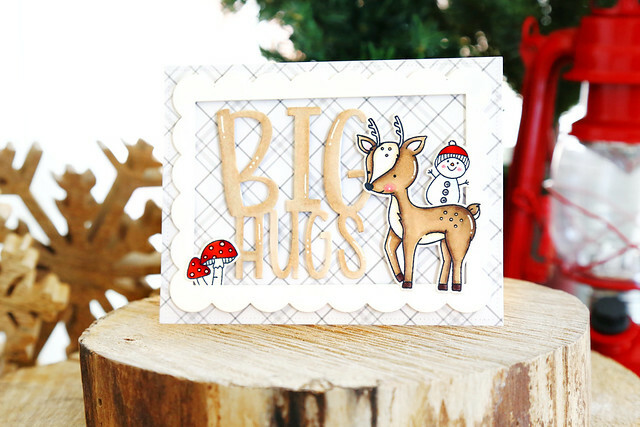 I'm joining with Neat and Tangled to show off a new die, Big Hugs. 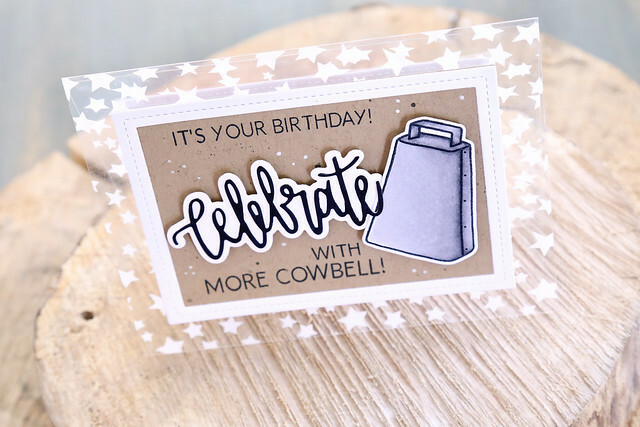 It's a great oversized sentiment die in such a fun font! I paired it with the deer from Into the Woods, and the snowman from Beary Merry, and made a frame out of the new Scalloped rectangle dies. All of the new products will be for sale in the NT store as of TOMORROW, October 14th at 8AM EST. I can't wait to see some of our new products featured in your own creations! For now, visit the NT blog to see what the rest of the design team has made - click! It's hilarious! And I always love having images in my stash that I could use for the guys. The slightly older guys, in this instance, haha. 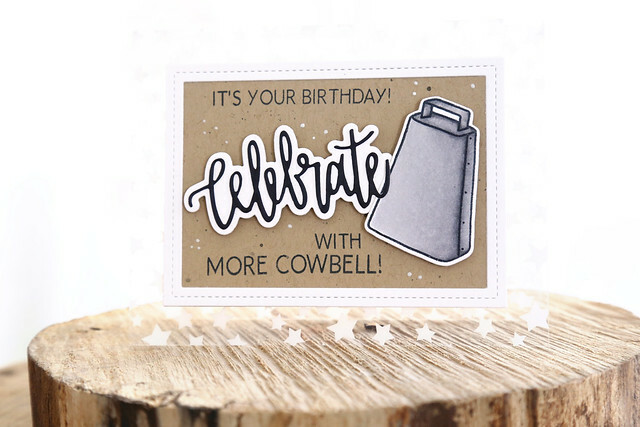 For this card, I colored the cowbell, and cut apart the sentiment to make room for the Celebrate die. The focal panel was adhered onto a sheet of starry acetate paper that I've had around forever. Hi there, and welcome back to another day of Neat and Tangled's October release week! 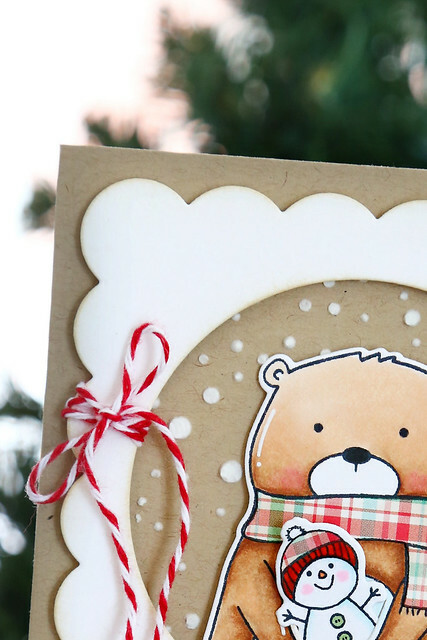 Today, I'm sharing the rest of my sets with you: Beary Merry and Little Baby Jesus. 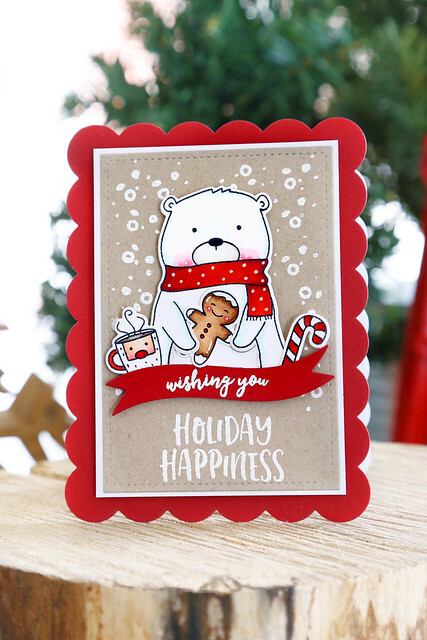 First up, Beary Merry. You may already recognize him! 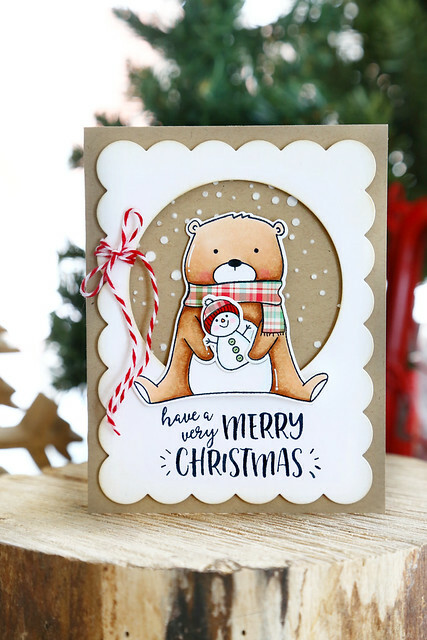 He was my most popular Christmas digi last year, but I keep getting emails asking for the stamp version. I love the dies we created, that allow you to slip the smaller images into his arms. 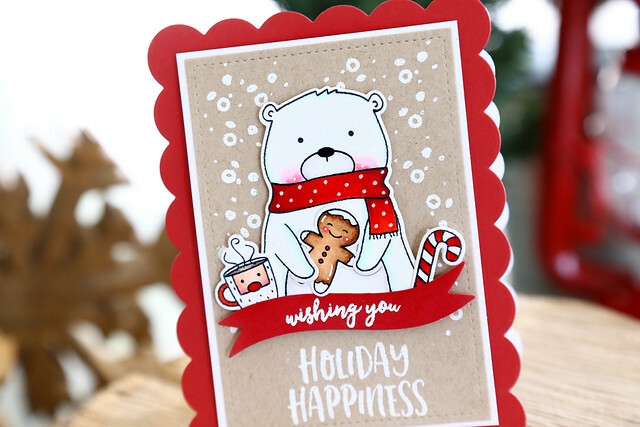 If don't love coloring, this polar bear is the ticket. I gave him rosy cheeks and a red scarf and called it a day. 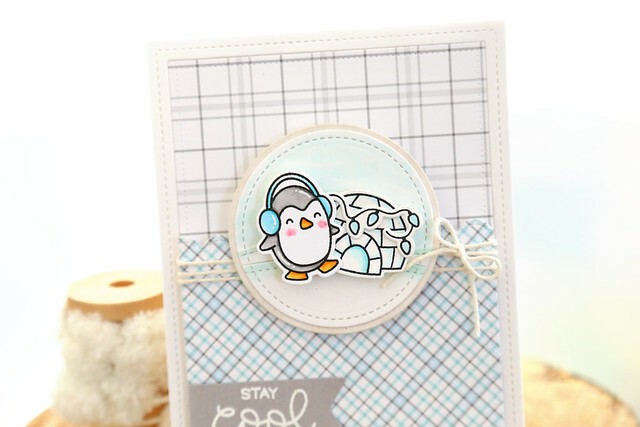 The little snow image included in the set is my fave - it's chunky and so fun to heat emboss. I just love that quirky Santa mug - but it's gotten mixed reviews at my house. My son thinks it's weird, haha. I would totally be drinking out of that mug near Christmas-time! Here, I colored the bear with my favorite brown copic combo: E30, E31, and E33. I keep a light hand when it comes to the darker colors. I colored yesterday's deer with the same combo. The sentiments in this set are so fun, aren't they? Love those fonts! 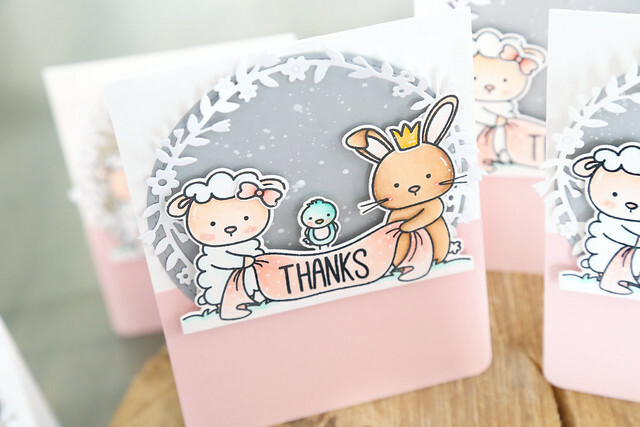 For both cards, I also used a new die set being released this month, Scalloped dies. They are so versatile, and I love the little banner flags included. I just think it is the sweetest image, and I love the sentiment. 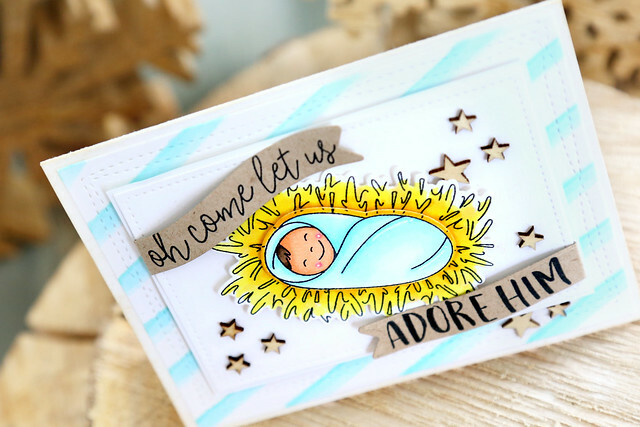 I used the banner flags included in the Scalloped die set to frame the image with the sentiment and added some wooden star accents. If you're still with me, thanks for stopping by! I'd love to know what you think of these new sets! And check out the NT blog this morning for more design team inspiration - CLICK! 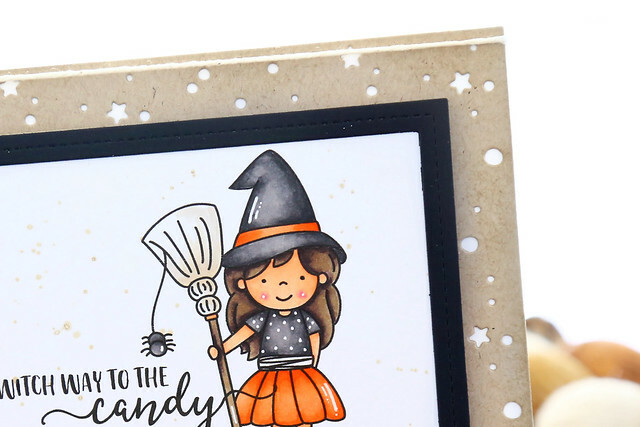 I am so excited to kick off Neat and Tangled's October release week with a new set that I designed, called Into the Woods. 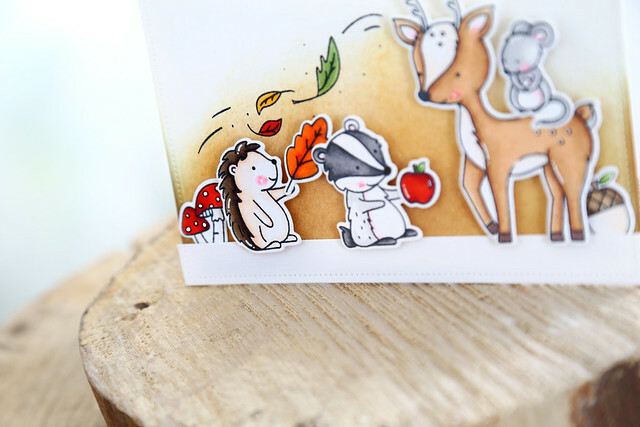 I illustrated the 4 critters that you see here: a hedgehog, a badger, a deer and a teeny little mouse. I just think that the little mouse is the sweetest! 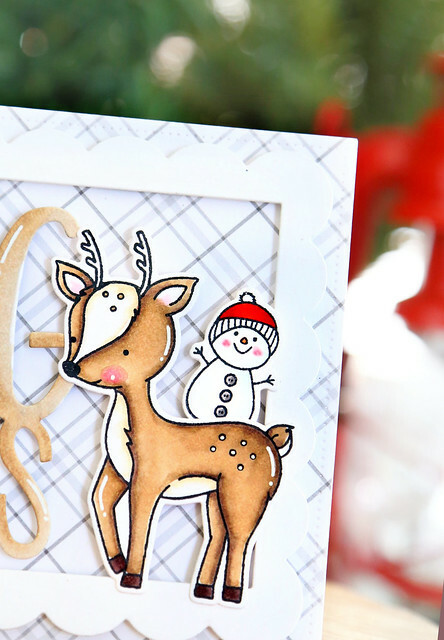 And that deer is perfect for Christmas and baby cards too, not just for fall! I stamped, colored and die-cut all of the images and set them onto an ink-blended background. 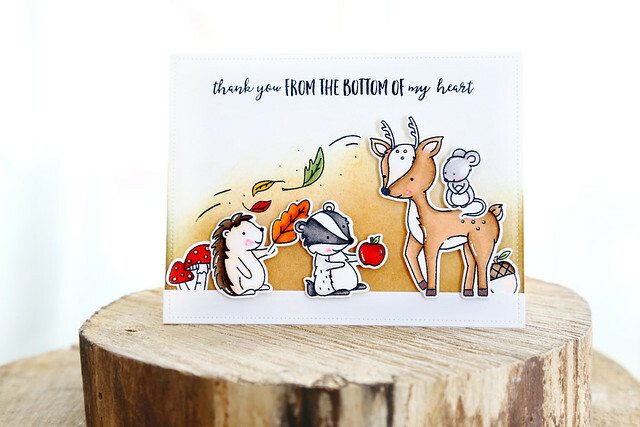 The leaves blowing in the wind is including in the set as one image - perfect for framing out the shorter critters and giving the whole card a sense of balance. 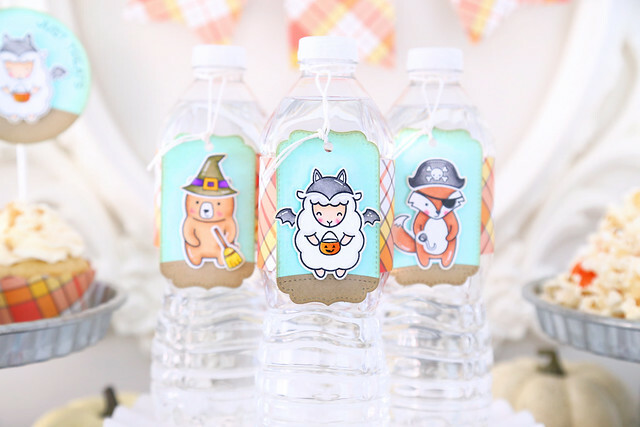 First up, these little tags are so easy to make! 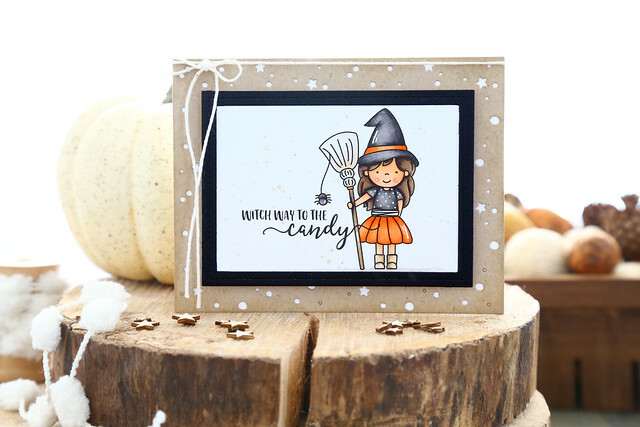 I just placed the little witch from the Pumpkin Carvings set over the sentiment. I colored her in brighter halloween colors, to make it less scary and more cute for the littles. I showed my daughter the tags, and she's excited to color a bunch of them for her friends. That's the beauty of digis! 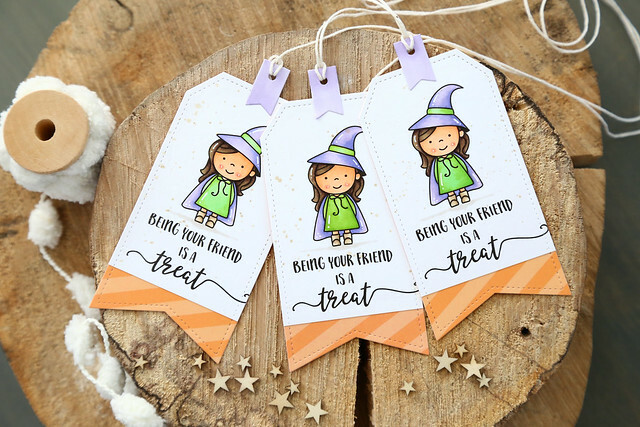 I'll just print and cut out the tag shapes and she will happily color and gift them with a little halloween treat for her classmates. These lovely ladies are too cute to spook! I hope you like them too - check them out in the Just ME digital stamps store - click!